Home Local News READ! Kumpletong Listahan ng 100 Congressmen at 20 Senator na Sangkot Sa PDAF Scam na Isinumete ni Janet Napoles! READ! Kumpletong Listahan ng 100 Congressmen at 20 Senator na Sangkot Sa PDAF Scam na Isinumete ni Janet Napoles! Due to some rumors that Janet Lim Napoles would became a state witness against to her former clients who allegedly misused the pork barrel funds, some politicians believed that many of the personalities involved would go to prison if the pork barrel queen will testify. In her affidavit that submitted to the Department of Justice three years ago, Janet Lim Napoles listed the names of the 20 senators, 100 congressmen that she allegedly transacted with. Some even reported that Napoles might even not even included the names of the other politician because someone influenced her, but now as a state witness, the lawyer of the pork barrel queen said that she’s ready to spill the beans. 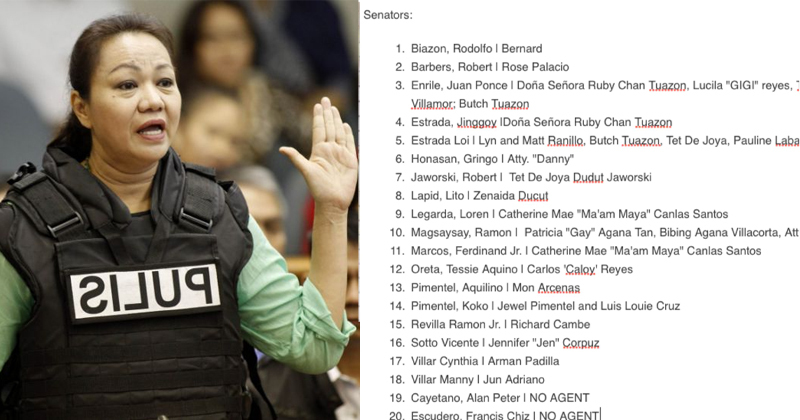 This are the list names of the politician with their agent that Janet Lim Napoles implicated on 2014. Benhur Luy was the former finance officer of Janet Lim-Napoles. Do you believe that Napoles didn’t revealed the complete names of her clients? Is the Pork Barrel Queen was not the most guilty in the Pork Barrel Scam? Is there people that more higher than her? All of that might be answered once Napoles became a state witness. Justice Secretary Vitaliano Aguirre revealed that talks are underway for making alleged pork barrel queen Janet Lim Napoles a state witness in the Justice Department’s reinvestigation of the P10-B pork barrel scam. But several politicians already opposed the alleged plan of the government to turn Napoles as state witness including Senator Kiko Pangilinan and Leila De Lima. According to Senator Leila De Lima, the government might use Napoles to blackmail and threaten any remaining opposition in Congress. Pangilinan said that the idea to make Janet Lim Napoles as state witness was ridiculous. “Paano nangyari na yung pinakamalaki ang nakulimbat sa pork barrel na mas malaki pa sa bawat politico – dahil sa lahat nung congressman at senador na kanyang kasabwat ay may hati siya — ay gagawing state witness?” said Pangilinan in a statement.